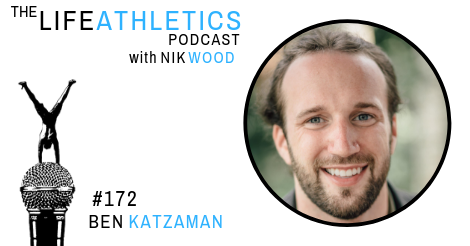 Hey Life Athletes, welcome to episode 172 of the Life Athletics podcast! Today’s guest Life Athlete is Ben Katzaman. I consider Ben as a genius. He started off as one of my coaching clients, sharing about his struggles in business and how he needed more energy for his business to thrive. He was almost ready to give up. Ben took matters into his own hands by removing the blocks and working toward his goals, eventually crushing the business he started with the local Balinese community. It’s true that when you take on a mindset shift (and putting in a lot of hard work), things can become better. Business improves. Your entire life unravels to show you what you’re good at and what will help you skyrocket toward your goal. Ben founded the social enterprise called Wanderer Bracelets - after getting lost in the Balinese jungles and stumbling into talented artisan carvers. He asked them to make bracelets for him to bring back to friends at home. In time, he discovered that this could be something that could work really well - both for him and for the locals. He loves supporting the artisans and helps them by understanding exactly what they need and what their struggles are, and how he can make their lives better by providing them a sustained, long-term livelihood that the can actually get income on a daily basis from. Learn more about Ben’s amazing “wandering” journey and get ready to be inspired. Get your own Wanderer Bracelet here.